Former Blue Ridge High track coach David Hickman doesn't come across as someone who's being treated for advanced pancreatic cancer. In fact, his focus these days looks remarkably akin to what he's been doing for the past 25 years of his life; teaching young people how to succeed in high school and beyond. Obviously, there are more challenges these days, more hurdles to clear. "There are days when I'm fine, and there are days when I have no energy at all," Hickman said. "But, I'm not going to give it up." Hickman, who teaches honors biology at Riverside High, said the diagnosis was totally unexpected. He said a physical completed last June indicated that all was well. Then, in late July, Hickman started having abdominal pain, among other issues. His doctor ordered a battery of tests. By late August, before all the tests were completed, Hickman said his appearance changed. His skin color turned jaundiced, while his eyes were "bright yellow." On Sept. 1, after additional testing, he was diagnosed with pancreatic cancer. "It just kind of came about really quick," he said. There's no family history of any cancer in his immediate family, though, as biologist, Hickman knows most cancers don't have a genetic link. "It could have been chemicals I was exposed to early on that helped trigger the cancer, or it could have just started on its own where the cell cycle breaks down," he said. Hickman is receiving chemotherapy drugs every two weeks. He's currently in the ninth round of a 12-round drug regimen that ends in early March. At that time, Hickman and his physicians will decide what approach to take going forward. Hickman began his teaching/coaching career in Greenville County in 1992 at Blue Ridge High, teaching and coaching football and track. He moved to Northwest Middle in 1999, remaining there for six years before going to Riverside High. Blue Ridge enjoyed several successful years in track under Hickman's leadership, and he has kept up with several members of those teams, including Neville Anderson, a sprinter for Hickman, as well as a young man whom Anderson describes as "needing some direction" during his high school years. "I was kind of a hot-head kid," Anderson said. 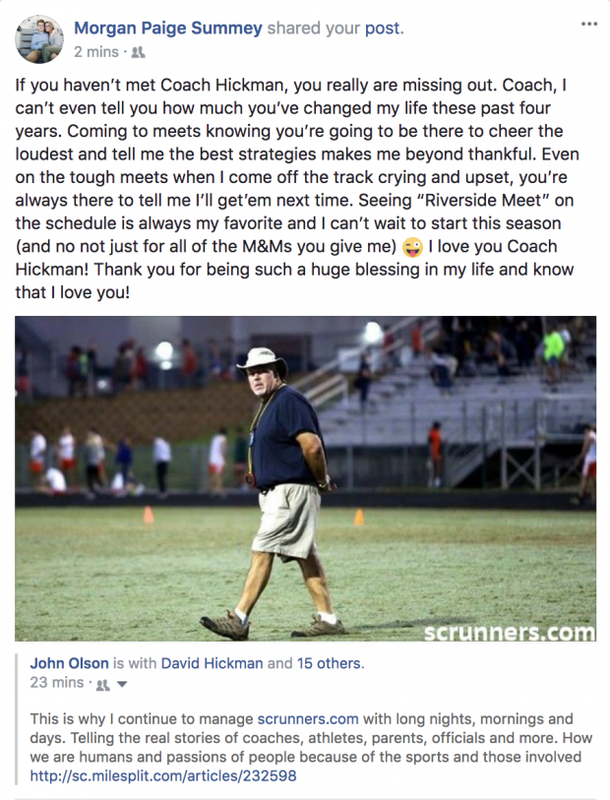 "Coach Hickman helped me stay out of trouble." Anderson said Hickman's influence on student/athletes doesn't stop at the end of the school day or after-school practice or upon receiving a diploma. After graduating from what was then North Greenville University, Anderson said Hickman and his wife, Linda, were there to help him get to the next level. "Coming out of college, I didn't know what to put on my resume or what to do next," Anderson said. He called the Hickmans. "He's always there," said Anderson, who now works at Michelin. "He's a gentle giant." Heather Blackmon Collins was also a member of those strong Blue Ridge track teams, competing in the 400 and 4x400, as well as discus and shot. "I would have run from Blue Ridge to Greenville for him," Collins said "He's one of those coaches who leads by example and you don't want to let him down." An embryologist and medical sales specialist, the Tigerville resident said Hickman sent her a message last October that he had been diagnosed with pancreatic cancer. "I was very, very heartbroken," she said. In that same message, Hickman told Collins he was looking forward to this year's track season, which she said speaks clearly to Hickman's character. "That's the kind of coach he is," she said. "It's never about him; never about his success. It's about the students, the team." Eastside track and cross-country coach Kelly Kidder first met Hickman four years ago. As one of the few female coaches in the sport, Hickman "kind of looked out" for Kidder. "He would help me out when I needed it," she said. "He was a mentor to me." Kidder was four weeks away from giving birth to her third child when Hickman learned of the cancer. Though most of Hickman's family, friends and those in the coaching community got the news a few days after the diagnosis, Kidder said Hickman waited until three weeks after the baby was born to tell her. "He kept it a secret from me because he was worried about what it would to do to me while I was pregnant," Kidder said. "He wanted me to focus on the baby." Kidder, who teaches one of the Hickman's three children at Eastside, said in the three years she has been a head coach, she has gained from Hickman the ability to connect with her student/athletes. "He does it in a way I've always admired," Kidder said. Hickman, who is 55, said he decided well before he was diagnosed with cancer to retire from coaching at the end of this school year. His intent at that time was to continue serving as a jump coach to a couple of athletes, which he still plans to do. 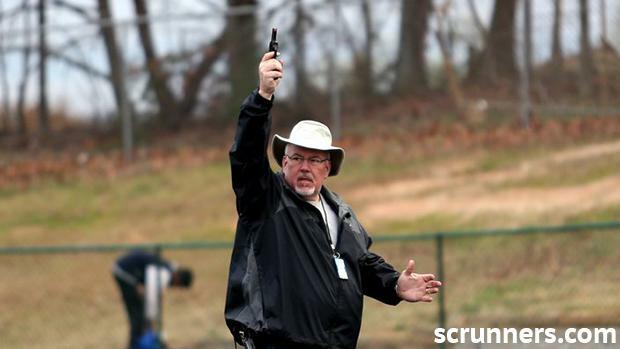 He's also a USATF official, serving as a starter at meets in Greenville County, as well as the Bojangles Classic and the state meet in Columbia. "I keep telling my wife she's going to have to drag me off the track, or I'll die on the track; one of the two," he said. "I'm not going to stop. I'm just going to keep plugging away." 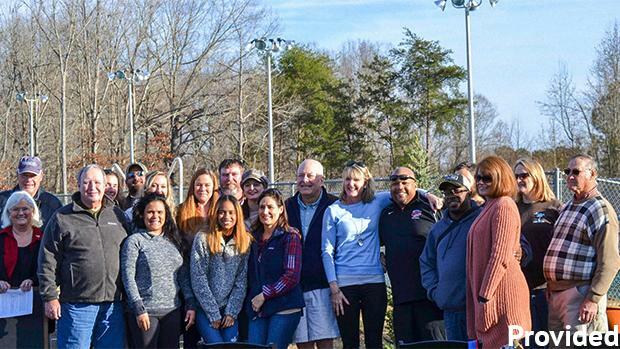 Last year, on the day after Christmas, a group from Hickman's Blue Ridge track teams dedicated a small garden and plaque in his honor. It sits next to the curve heading into the backstretch at the school's track.